Hours: 5:00 am to 5:00 pm. Location: Wherever you like to bird! The objective of a Bird-a-thon is to locate and identify as many bird species as possible in a given period. It’s an event where citizen science meets competition meets fun meets fund raising…. Teams of 2 to 4 people (or more, there are no set standards here) will spend 12 hours searching anywhere for birds. At the end of the day, we will compare notes among the teams, tabulate the total number of species seen and maybe come up with some cool surprises. A winner is declared! We are looking for teams and we are looking for sponsors. A sponsor will donate some amount of money per number of species seen that day. An average day could add up to 61 species. If one donates $.25 per species and then the total donation based on an average count is $15.25. Remember that is an average. A group of dedicated and lucky birders can find over 90 species in Florida this time of year - pledge accordingly. How can I find out more and sign up? 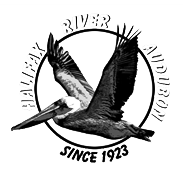 Email forbirds@halifaxriveras.org or call David Hartgrove (386) 235-1249 for information on registering a team or making a pledge/donation. Ready to pledge? Click here.